A RV is your passport to the open road. When your windshield gets damaged, the open road may seem out of reach. Don’t worry, the friendly staff at the Auto Glass Warehouse are here to help you with an RV windshield replacement to get you back on the open road. Place a quick call to any of our local office numbers and we will be glad to help you set up a insurance claim or self pay appointment. Insurance claims for RV windshield replacements are easy with us. All that we will need to do is place a fast 3 way call with you to your insurance company to set up the claim. Please be advised, you will need to have your policy number handy as well as the year, make and model of your RV and the VIN number. Your insurance agent may also ask for the date the damage occurred as well as how it happened. If you are unsure as to how your windshield was damaged, that is ok. For self-pay customers, we will also need the year, make and model of your vehicle and the VIN number. 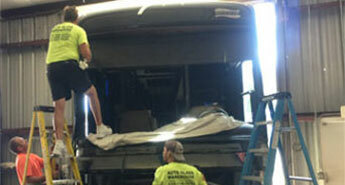 Our technicians are ready to get a new windshield installed in your RV and get it back to factory specs. 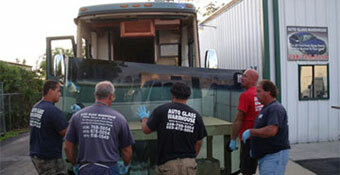 They are all trained and certified in RV windshield replacement and repair, as well as all other types of auto glass. Please be assured that each windshield replacement is done with precision to provide an accurate fit and complete customer satisfaction. With an RV windshield replacement, it is highly likely that there will be to 3 technicians present to ensure the safety of our technicians as well as your RV and the windshield. Many of our technicians will use certain tools that you may not be familiar with during your RV windshield replacement. These tools will not harm your RV or the windshield and are used to make our technicians jobs easier and guarantee the best possible replacement. All of our technicians are mobile ready with all the equipment they could need for all windshield replacements. If you do prefer, your RV can be brought to our main shop in Fort Myers to replacement your RV windshield as well. When you call in to our shop for your RV windshield replacement, please be sure to let our office staff know if you would like to bring your RV into the shop to have the windshield replaced. Also be sure to tell the staff if your windshield has any specialty features such as a rain sensor.